One of the hardest tasks as a parent is picking someone to care for your children when you can’t be there. Whether for one hour or the whole day, that person will be responsible for the most precious people in your life. When you find the right person, s/he becomes like family. We were lucky enough to find that person eight years ago—Marlene. She came highly recommended from a friend (the best way to find a caregiver), who had her as her daughter’s nanny for over ten years. 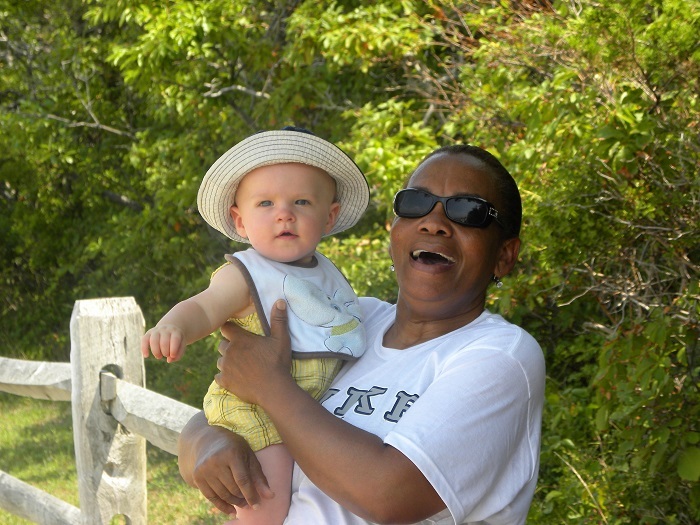 Marlene started when CJ was about two months old and was with us for seven years, until last March when we needed a nanny who could drive. While Marlene was with us, she carried out my wish that the boys were read to whenever there was a spare moment. She took them to the library like it was their second home. 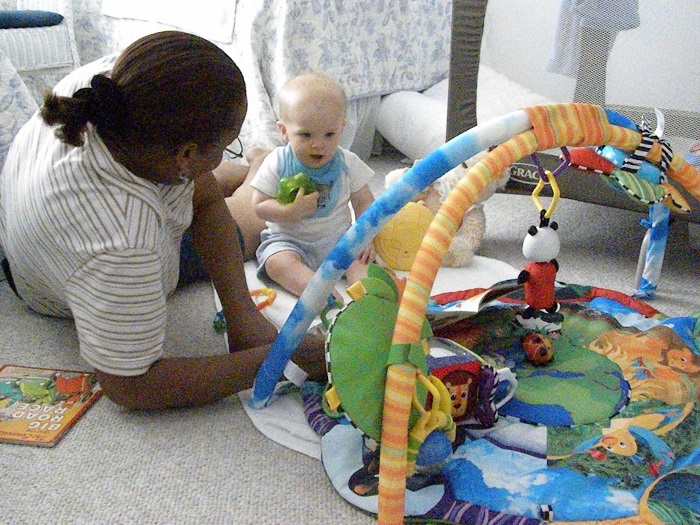 Patiently, she cared for them—from rubbing the flat spot on CJ’s head to teaching them letters and words. Most of all, she loved them like her own children. 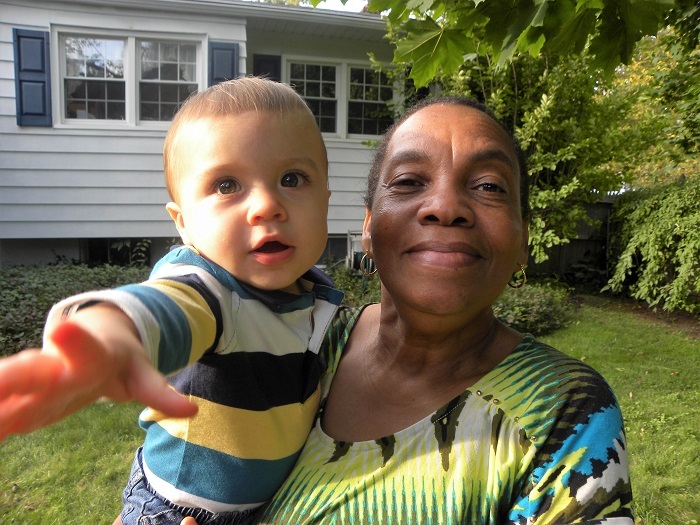 Last month, we said our final goodbye to Marlene after she passed away peacefully in her home. When we switched nannies, I turned to books to help the boys talk about how they were feeling. Change is hard for kids. It was particularly hard for Cam, who spent most of his day with Marlene. When Marlene passed away, we read books to understand that it’s ok to feel sad or mad or whatever and that they are loved—by Marlene and us—always. There aren’t many books about changing a nanny. (I’m putting it on my “Picture Book Ideas” list.) It’s easier to find books about death. But in my search, I found ones that could work for many situations. Though a sad topic, I hope these recommendations will help in your time of need. This first book is by one of our favorite authors: Mo Willems. As usual, he weaves a tale so simple, yet so full of meaning. City Dog and Country Frog become friends in the spring and play. And again in the summer and fall. But in the winter, Country Frog isn’t there. When spring returns, City Dog doesn’t find his friend again. But he finds something else. Since the book isn’t explicit about what happens to Country Frog, you’re open to interpret it in a way that works for your situation. Maybe Country Frog moved or got a new job or died. Whatever you or your children decide opens a conversation about loss, how City Dog must feel, and how you and your readers might feel about the loss in your lives. And if one thing is for certain, talking will help get your children through your time of difficulty. Even if they can’t yet put into words what they are feeling, sharing your thoughts and feelings can model how to deal with the loss in their lives. While you may not know exactly what they’re thinking (as frustrating as that is), you want to make sure they don’t feel guilt or confused during a time of loss, and, above all else, know they’re loved. The most important thing we can do for our children is let them know that they are loved. When there’s a loss or death of someone close, it is even more important. Luckily, there are lots of books about love. Check out our Valentine’s Day and Love Mantra posts for a few books and ideas about sharing our love. In addition, the following books remind children that even if a person isn’t with them, they are loved. They’re not specifically about death so can be used for other situations like a faraway grandparent, a nanny that’s moved on, or a traveling parent. I originally started our Love Mantra with the boys before a business trip. I wanted to make sure they knew how much I loved them. The mantra made it easy for them to remember. The Invisible String by Patrice Karst, illustrated by Geoff Stevenson is another way to help your children know they’re loved and feel connected with you, no matter where you are. In the story, Jeremy and Liza are awakened by a storm and want their Mom close by. She tells them that she’s always there because they are connected by an invisible string made of love. This gives a more literal meaning to “tugging on your heart strings.” Before a recent trip away from the boys, I got this book for them. When Cam and I would talk, he’d say he was pulling on our string. Did I feel it? Of course I did! It was a nice, new way for him to know that I’ll always be in his heart. 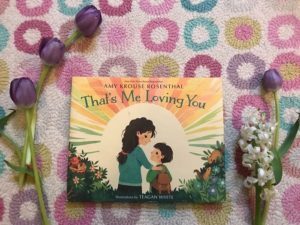 A very poignant book because author Amy Krause Rosenthal passed away at the young age of 51, leaving behind three children, That’s Me Loving You is a reminder that the love of a person (whether with you or apart) is all around you. A shimmering star, drifting cloud, clap of thunder, persistent mosquito, bright sun—all can be seen as signs from someone you love. I think this is another comforting thought. Even if you don’t believe the person is communicating with you, it might just be a reminder of that person. This really connected with me because whenever I see leaves waving their underside, I think of my Grandmother. She always said that was the sign rain was coming. Maybe now, it is her waving. The Invisible String and That’s Me Loving You remind children that they’re never alone. They’re loved, even if the person loving them isn’t right there. Whether it is death or loneliness, changes in a child’s life can bring on a rush of emotions. Children don’t always understand these feelings. While talking about them is important, it isn’t always easy. Here’s a great book to help. This is a beautiful book inside and out. A heart is cut into every page and grows smaller throughout the book. Christine Roussey’s illustrations show how each feeling affects us while Jo Witek’s words are perfect to describe them. 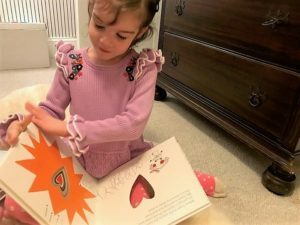 It is like a picture dictionary to help children explain what they’re feeling—happy, brave, mad, calm, broken, sad, hopeful, afraid, silly, and shy. Recently, I found CJ pouring over this book. When I came up to him, he pointed to the exploding heart and said, “This is how I felt today. I felt like my heart was going to burst I was so angry.” From there he explained more. What I loved is that he was able to pinpoint how he was feeling and explain. And it was this book that helped. As we’ve dealt with Marlene’s death, I felt it was less important that the boys know the specifics of death and instead know that she’s at peace and watching over us. This is not a foreign concept to them. My grandmother and aunt passed away when CJ was little, but we have pictures of them and we often tell stories about them. The boys know G.G.Ma and Great Aunt Grace are watching over them from heaven. Now Marlene is, too. But sometimes you need to be more explicit. 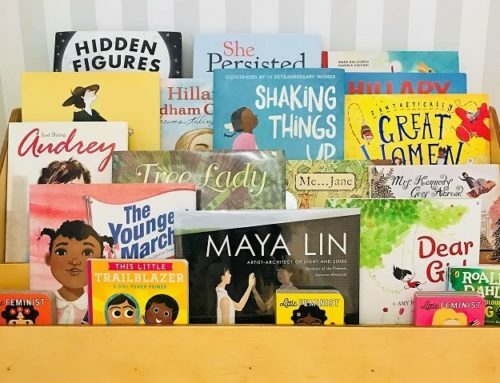 For a death of a grandparent or if a child will participate in the services—or for a child with lots of questions—these books may be right for you. 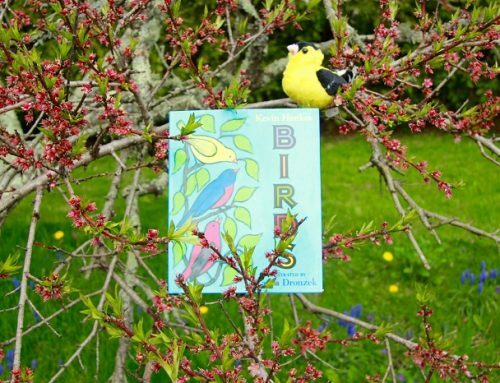 This very literal book by psychotherapist and counselor Pat Thomas, illustrated by Lesley Harker, explains death is a natural part of life. It discusses the practical: many reasons why, customs for saying goodbye, and thoughts about the afterlife. It also touches on the emotional part. People might feel sad, angry, afraid, guilty, and even happy. Dr. Thomas also provides discussion questions and “How to Use This Book” for further guidance. Why death? Well, these opposite pulls are necessary: sorrow and joy, grief and delight. “What would life be worth if there was no death? Who would enjoy the sun if it never rained?” are some of the questions the book asks. When Death takes the grandmother, he says to the children, “Cry, heart, but never break. Let your tears of grief and sadness help begin new life.” To me this means that while it’s natural to be sad, honor the person you love by embracing life and doing great things. When asking friends for book recommendations, I found some of the suggestions were about the death of a pet. Since the loss of a pet can as hard as a person in the lives of families and children, I thought I’d share. Recommended by a dear friend who loves animals, especially her dogs, this sweet book by Cynthia Rylant is what she and her husband read through tears to their girls when one of their dogs passed away. She remembered the “ham-sandwich biscuits” because, of course, there are lots of treats in heaven and why not ham-sandwich ones? But heaven for dogs has lots more—fields to run through, children to play with, and clouds that make fluffy beds. There’s even angels who take the dogs back to Earth for an invisible walk to sniff their old home and follow their children to school. For children feeling unsettled about their dog’s death, they’ll know they’re in a good place with God watching over them. One of these days—hopefully not soon—I’m going to need a version of this for our cat. This nonfiction title is dated, but provides an explanation of the death of a pet by none other than Mr. Rogers. Not only does it explain many aspects of death, but also the different feelings children (and adults) might feel. A final find while we’re on tough subjects… When I found it, I had to share. My cousin started her fight with breast cancer two years ago. I wish I had found it then for her girls. This simple but powerful book by Jessica Reid Sliwerski, illustrated by Mika Song, is about how a Mom fights cancer. While very little detail is provided, the book explains how the Mom goes through surgery, chemo, radiation, and other aspects of a cancer fight. I love the message: “Mama is a cancer-fighting superhero,” and her kids help fight with kisses, hugs, laughter, and love, all of which cancer hates. Mama is strong because of her kids. Thankfully, this is not about death, but tackles what can be just as hard an emotional journey. For kids who don’t know how to help a sick parent, this is the perfect advice for them and every situation. When in doubt about what to do—in death, loss, or sickness—just LOVE. Talk about your memories. The memories we have of people not only keep them alive in our hearts, but remind us of the good times. 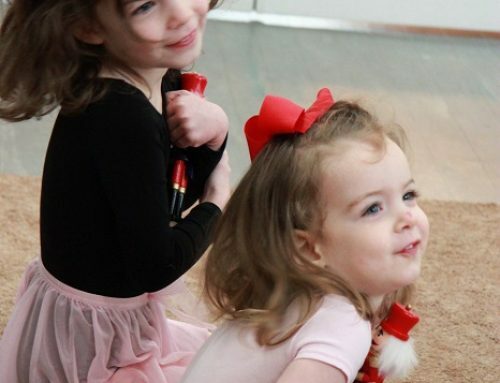 Remembering and talking about fun times may even put a smile on your child’s face. After we told the boys about Marlene, we each took a turn sharing our favorite memory of her. CJ fondly remembered how she used to sleep over wearing her nightcap and frog pajamas. Cam said that his favorite thing he did with Marlene was afternoon baths. The next day he had one in her honor. Make a photo or picture album. Pictures help us remember, too. Find pictures of your loved one or have your children draw some. Then create a special album or message to look back and remember. Write a note. Getting out our feelings by writing or drawing can often help with the grieving process. I do this whenever someone close to me passes. It is a way of writing down my memories and even something I would have wanted to say to the person. 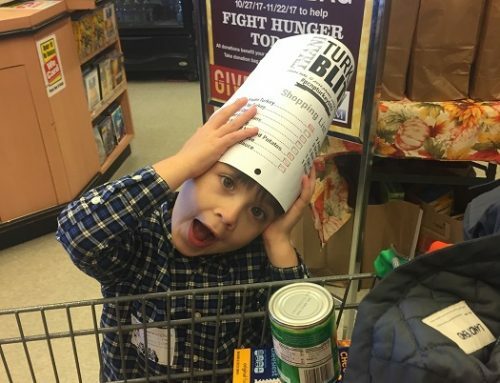 This can work for your kids, too. Once they write the note or draw, you can share it with the person who left. If the person has passed away, the note can be put in their coffin, given to the family, or “sent to heaven” in some way (like letting it fly off into the wind or riding a wave of the ocean). CJ wrote Marlene a note, which we gave to her family at the wake. Loss—whether death or a departure—is traumatic for kids. 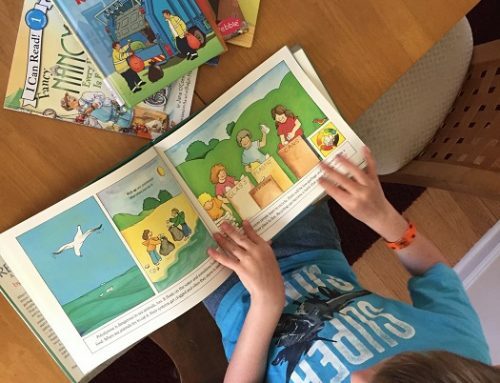 We hope this collection of books and activities will help your family. Please share other books and activities that have gotten you through a hard time to support others in their time of need.